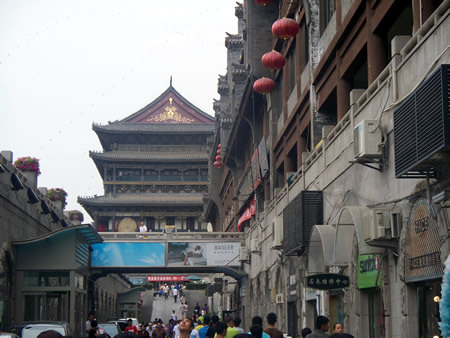 Xi’an is the capital of the Shannxi province. The old city has an old defensive wall built around it. We were staying within the centre of the wall in a hotel called Shanxinanfang Hotel. We were the only tourists staying in the hotel. The staff spoke very little English, but we managed to get by fine. We had to move rooms the first day because the bathroom smelt really bad. I was trying to explain to the lady on reception that we wanted to move room and why, but she didn’t understand. So the only way I could get the point across was by using hand gestures. She finally got the point and I think all the other customers waiting at the reception also did! Other than that the hotel has been great. We are located 5 minutes walk from the Bell Tower, which is the central point of the city. Xi’an is a beautiful city with lots of character. 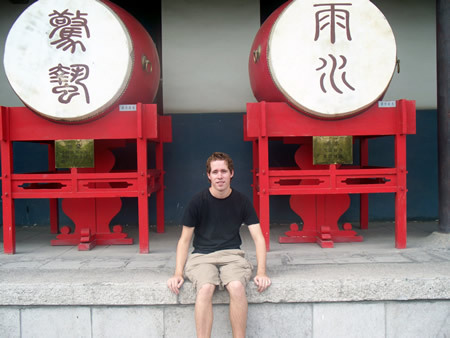 There is a bell tower and drum tower in the centre of the city, which we went to visit. The bells are rung at dawn and the drums are played at dusk every day. The entrance ticket for the bell tower and drum tower costs 40 yuan (£4) for both tickets. You can get them on the subway on your way over to the bell tower. We watched a performance in both the drum tower and the bell tower. 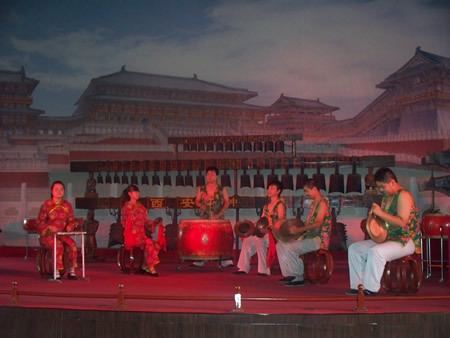 In the bell tower a group of Chinese Musicians played various traditional instruments, including the wooden flute, Erhu (2 stringed fiddle), Yangqin..
With only having 5 days in Xi’an, we feel that it wasn’t quite enough time to see everything. We are heading to Shanghai today. We leave on the train at 5:45pm local time and will arrive in Shanghai at around 14:30pm tommorow. Sorry this blog is very short and not very detailed but we are rushing to get out of the hotel for checkout time. We will write more when we arrive in Shanghai.